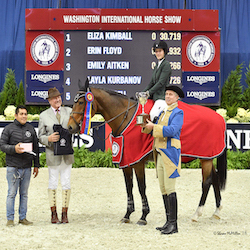 Washington, D.C. - The Washington International Horse Show (WIHS), a leading national equestrian event based in Washington, D.C. since 1958, is proud to announce Anna Rossi of Washington, D.C., as Youth Ambassador of the 2010 show. WIHS received dozens of applications from very qualified students in the D.C. metro area, Maryland, Pennsylvania and Virginia. Rossi will serve as the second WIHS Youth Ambassador following Jamal Brown. Rossi, 15, is a sophomore at the Field School in Washington, D.C. She has attended WIHS for many years with her family and has qualified to ride at WIHS five times. She is hopeful to qualify for the 2010 show. "We are thrilled to welcome Anna to the WIHS family. Her love of horses, experience and commitment to equestrian sport and this show make her the perfect person to serve as Youth Ambassador," said Juliet Reid, WIHS President. In this role, Rossi will reach out to the younger area equestrians and the local D.C. community and help give WIHS a youth perspective as we develop events from Barn Night to Kids Day. "Anna will thrive in this role; she is outgoing and very knowledgeable about the equestrian industry. She has strong support from her family and trainer as well. We look forward to working with Anna and for her to share her experiences and learn from our team," said Tony Hitchcock, Chief Operating Officer, WIHS. "Anna will use her voice and experience to inspire youth and help us to broaden support for our event by the D.C. community."